Laundry care symbols with instructions in Japanese. The four symbols shown indicate that the garment must not be washed in water, must not be bleached, may be ironed only with a protective pressing cloth, and must be dry cleaned. A laundry symbol, also called a care symbol, is a pictogram which represents a method of washing, for example drying, dry-cleaning and ironing clothing. Such symbols are written on labels, known as care labels or care tags, attached to clothing to indicate how a particular item should best be cleaned. Standard symbols for these care labels differ by region. In some standards, pictograms coexist with or are complemented by written instructions. The Canadian system was formerly based on colour: green for "go ahead", yellow for "be careful", and red for "stop". That system was abandoned in favour of a common North American scheme. Although there is an international standard that has been agreed by the ISO and within Europe by the EU, copyright laws make it difficult to publish these widely. However, there have been attempts to summarize the main national and international standards. GINETEX, based in France, is the European association for textile care labelling, and formed in 1963 after academic conferences in the late 1950s were formed to define one standard of labelling. The care label describes the allowable treatment of the garment without damaging the textile. Whether this treatment is necessary or sufficient, is not stated. A milder than specified treatment is always acceptable. The symbols are protected and their use is required to comply with the license conditions; incorrect labelling is prohibited. A bar below each symbol calls for a gentler treatment than usual and a double bar for a very gentle treatment. A stylized washtub is shown, and the number in the tub means the maximum wash temperature (degrees Celsius). A bar under the tub signifies a gentler treatment in the washing machine. A double bar signifies very gentle handling. A hand in the tub signifies that only (gentle) hand washing (not above 40°C) is allowed. A cross through washtub means that the textile may not be washed under normal household conditions. In the European standard, the level of wash agitation recommended is indicated by bars below the wash tub symbol. Absence of bar indicates a maximum agitation (cotton wash), a single bar indicates medium agitation (synthetics cycle) and a double bar indicates very minimal agitation (silk/wool cycle). The bar symbols also indicate the level of spin recommended with more bars indicating lower preferred spin speed. An empty triangle (formerly lettered Cl) allows the bleaching with chlorine or non-chlorine bleach. Two oblique lines in the triangle prohibit chlorine bleaching. A crossed triangle prohibits any bleaching. A circle in the square symbolizes a clothes dryer. One dot requires drying at reduced temperature and two dots for normal temperature. 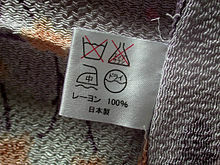 The crossed symbol means that the clothing does not tolerate machine drying. In the U.S. and Japan, there are other icons for natural drying. The iron with up to three dots allows for ironing. The number of dots are assigned temperatures: one prescribes 110°C, two for 150°C and three for 200°C. An iron with a cross prohibits ironing. A circle identifies the possibilities of professional cleaning. A bar under the symbol means clean gently, and two bars means very gentle cleaning. The letters P and F in a circle are for the different solvents used in professional dry cleaning. The letter W in a circle is for professional wet cleaning. ^ "Guide to Apparel and Textile Care Symbols". IC.GC.ca. Office of Consumer Affairs. ^ "Caring About the Consumers Beyond the Label" (PDF). Intertek.com. Intertek. 2014. Retrieved 2014-04-20. ^ a b "Care Symbols". GINETEX.net. GINETEX. Retrieved 2018-03-21. 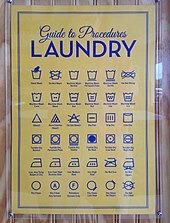 Wikimedia Commons has media related to Laundry symbols.